In the modern era, event marketing is likely to be driven by a content marketing strategy. After all, both onsite events and social media exist to facilitate information sharing and networking. In-person events are also often the logical next step for solidifying the online relationships that content marketers seek. But just how are today’s event marketers taking advantage of this onsite/online engagement pairing? 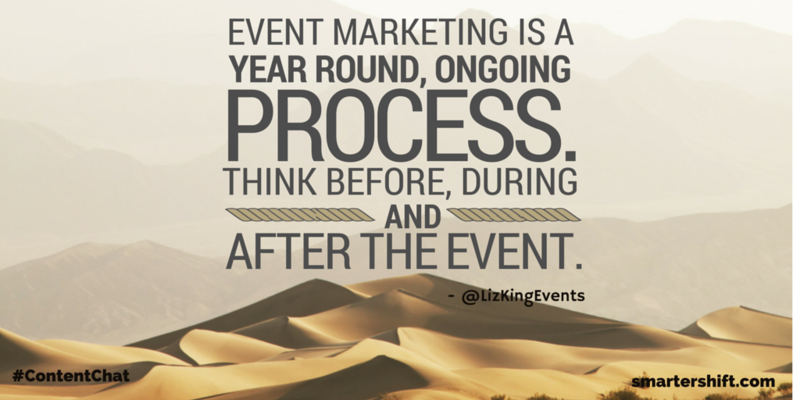 Liz King, Founder and CEO of Liz King Events and techsytalk will joined us this week to share her tips on marketing for events. You can read our summary of the chat, below.